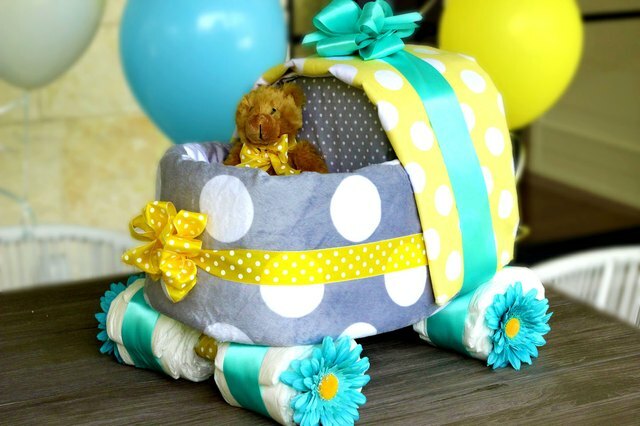 Besides being a delightful centerpiece that everyone will ooh and aah over, a baby carriage diaper cake is the gift that keeps on giving. 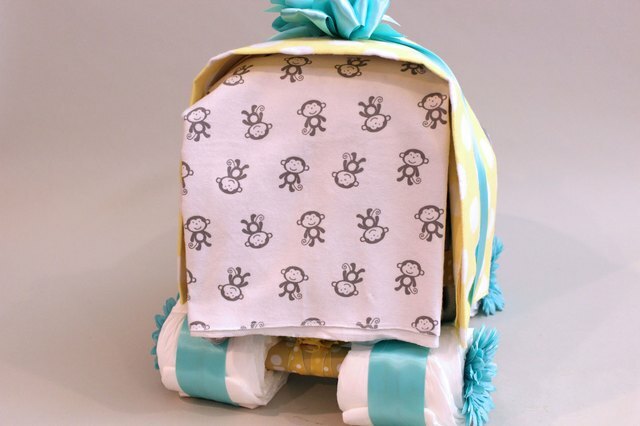 The baby carriage is made almost entirely of diapers and blankets, so after the shower, the expectant parents can take the carriage apart to use the individual components. While these diaper baby carriages can be expensive to purchase from boutiques, they're quite affordable to make yourself, and it's fun to get a group of friends to create one together. 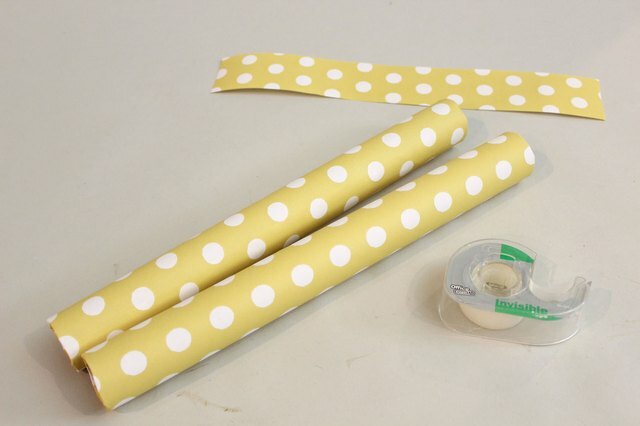 Wrap the paper towel rolls with decorative paper and secure them with tape. You can also use a cardboard roll from wrapping paper and cut it into 11-inch lengths. These will be the axles of the baby carriage. Now that the two axles are done, let's make the four wheels. Line up eight diapers so they overlap each other by about 2 inches. 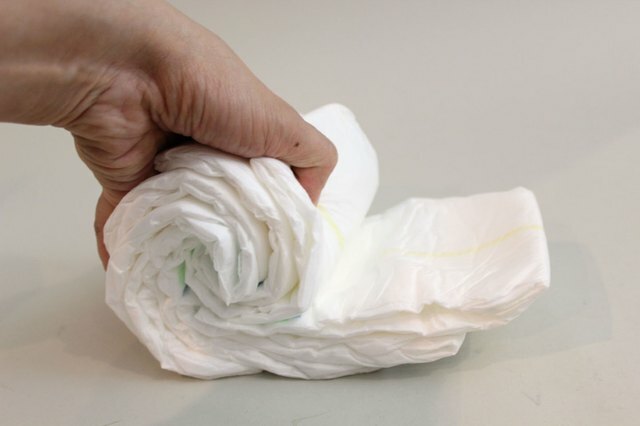 Then start from one end and roll the eight diapers together. It will look like a big cinnamon roll. Repeat four times to make the four wheels. Hold the wheels together with rubber bands. Then cover the rubber bands with ribbon, securing them with double-sided tape. The ribbon also adds a nice pop of color to the wheels. 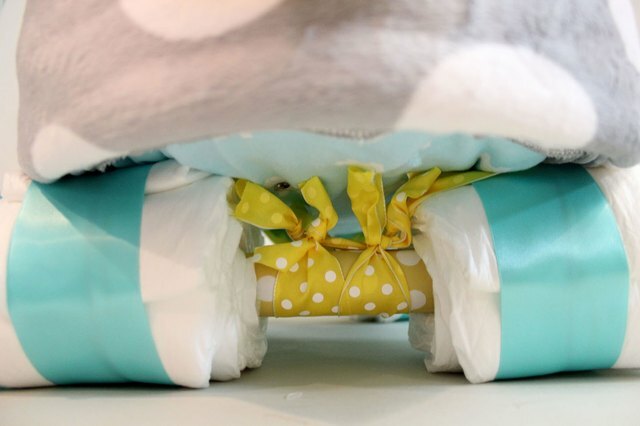 Slide a wheel onto both ends of the axles, through the hole in the middle of the diaper roll. Try to have all the diapers on each wheel facing the same direction. 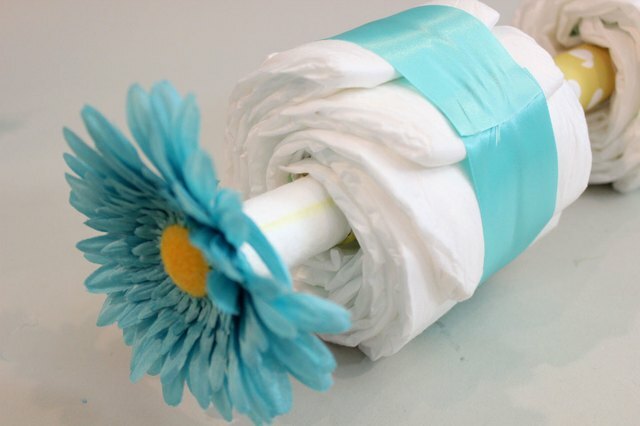 Tightly wrap the stem of a silk daisy with a diaper and insert the daisy into the opening of the axle/paper towel roll. Do this for all four wheels. The daisies will keep the wheels from falling off the axles. 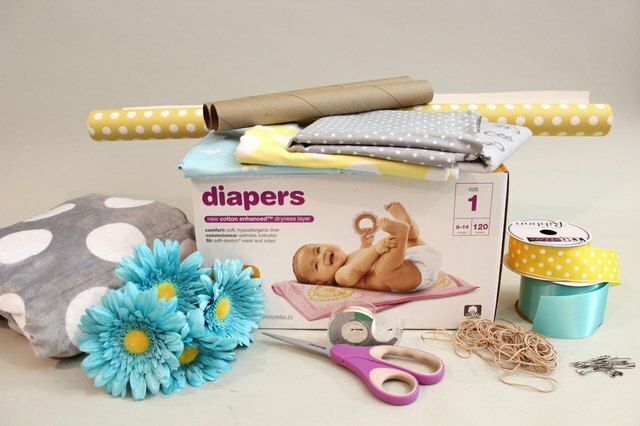 To make the bed of the baby carriage—the main section that sits on the wheels—form a stack 50 diapers and place them on their sides. 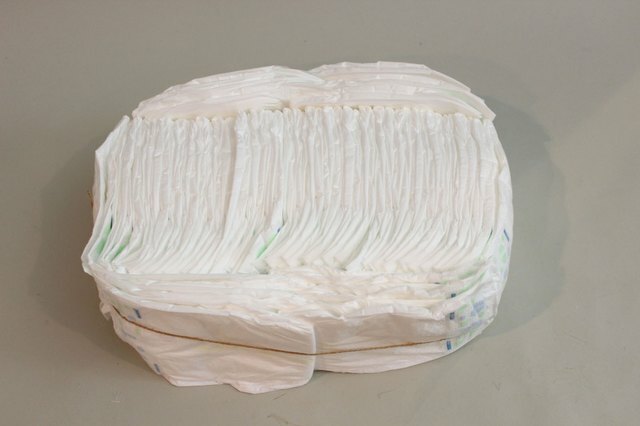 Then add six diapers to each of the long sides to fill out the shape. 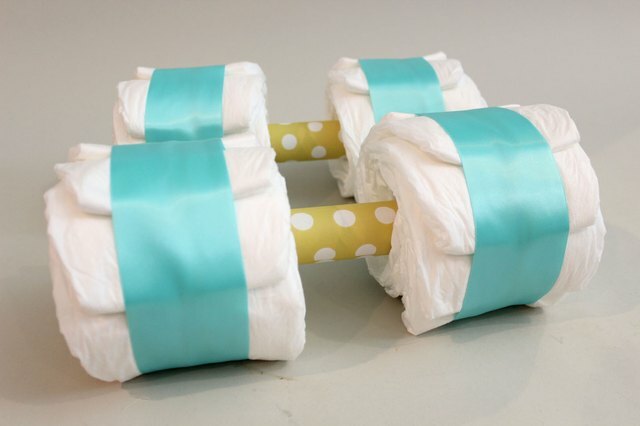 Tie all the diapers together with a rubber band or string. 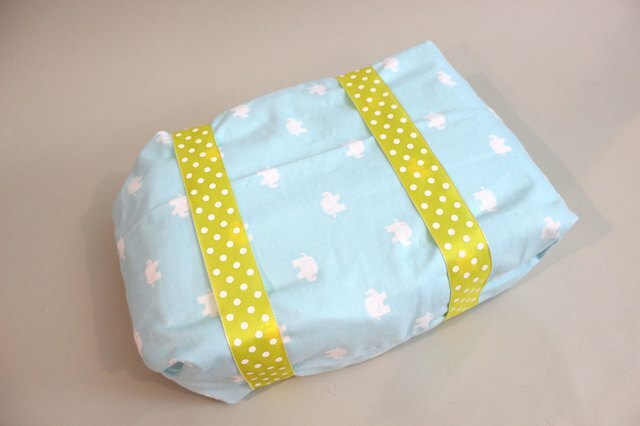 Wrap the diapers with the first receiving blanket as if you were wrapping a gift. Secure the ends with safety pins. The side with all the folds and safety pins will be on the bottom of the baby carriage and no one will see it, so don't worry if it's not too attractive. Wrap two lengths of ribbon around the bed, about 2 inches in from the two short ends. Tie the ribbon underneath; no one will see the knots. These ribbons will be useful later in securing the entire baby carriage to the wheels. 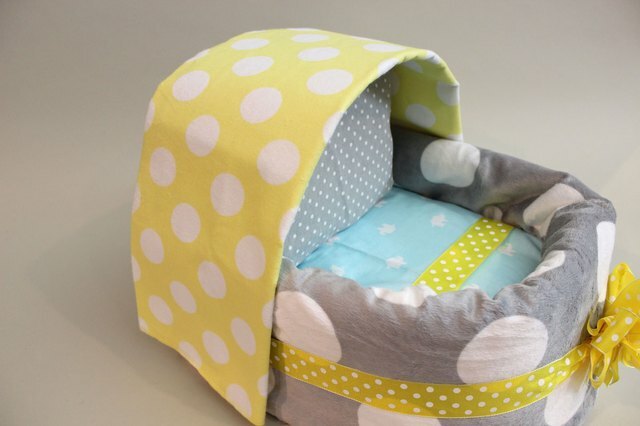 To make the sides of the baby carriage that surround the bed, you will use the 40- inch by 30-inch fleece blanket. Fold it lengthwise once, and then once again so you have a folded blanket that measures 7 1/2 inches by 40 inches. Safety pin the edges in several places to keep the blanket from unfolding. 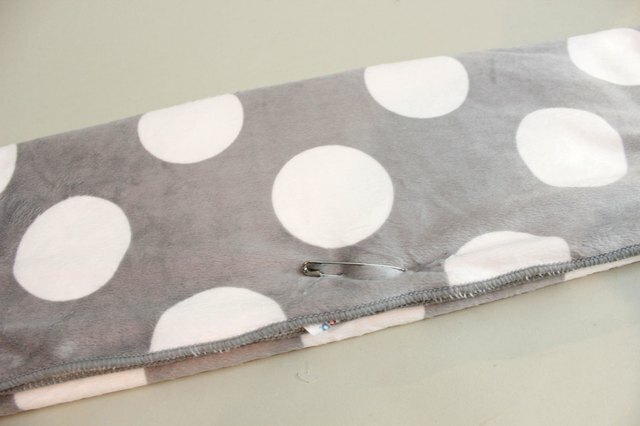 Hide a long piece of paper or cardstock inside the fold to help keep the blanket upright. Wrap the blanket around the bed, tying a ribbon around it to keep the blanket in place. The blanket should be long enough to cover three sides. Don't worry, the back of the carriage does not need to be covered, as other elements will be in the back. 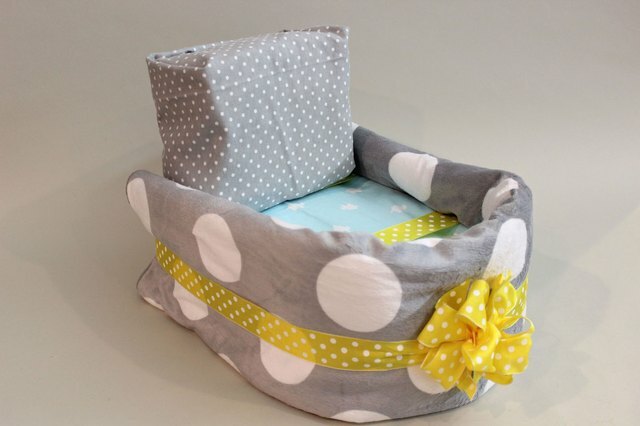 To form the pillow that will go in the back of the carriage, stack 10 diapers and stand them on their sides. 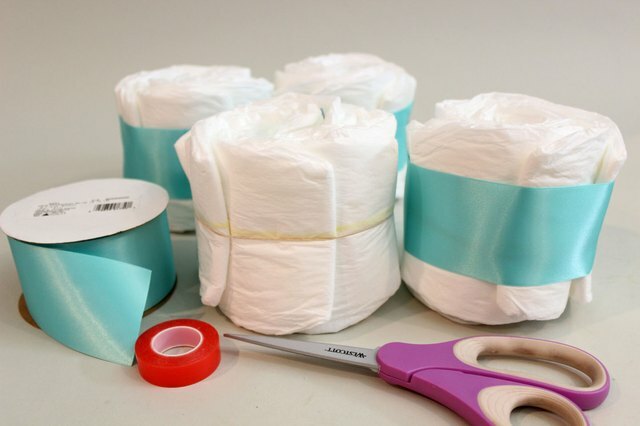 Wrap two diapers around both ends of the stack to form an oval shape and secure the diapers with a rubber band. Do this twice so you have two sets of diapers for the pillow. You can keep it to one set, but a higher pillow with two sets looks better. 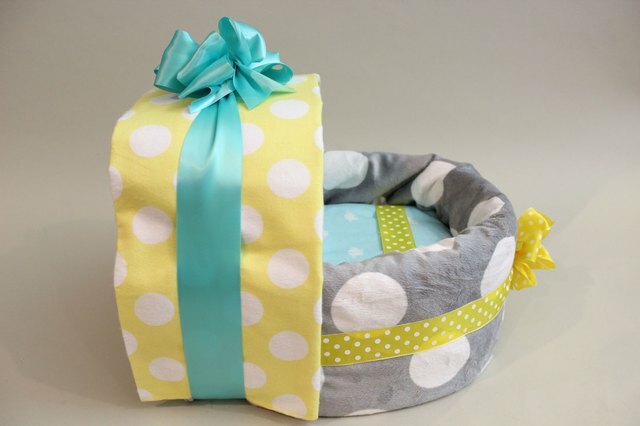 Stack the two sets of diapers to form a tall pillow and wrap them with the second of your receiving blankets. Secure the blanket with safety pins in the back. Again, don't worry about the safety pins showing, as the back will be covered up later. 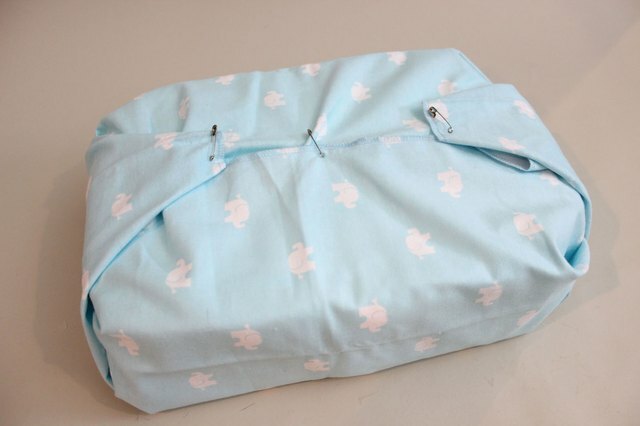 For the baby carriage's canopy, fold the third receiving blanket lengthwise so it is a little bit wider than the pillow. Drape the blanket on top of the pillow so that the blanket extends over the pillow. Hide a piece of paper or cardstock in the fold to maintain the shape of the canopy. 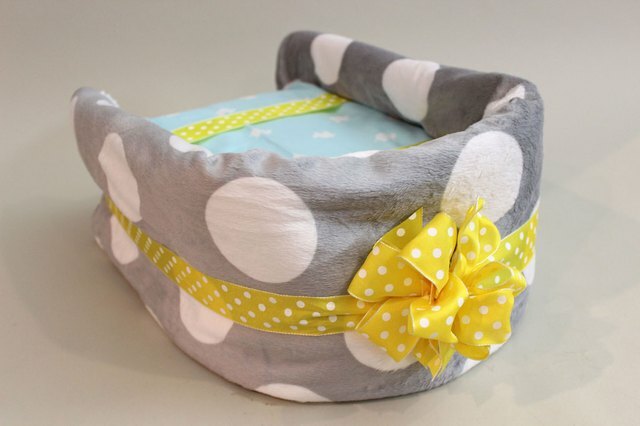 Tie a ribbon around the canopy, bed and walls to fasten these elements of the baby carriage together. Place a bow on top to make the carriage festive. Place the baby carriage on its wheels, spacing the axles and wheels so they are evenly distributed under the carriage. Now, remember the two ribbons that were tied around the bed? They should be right above the axles. Use additional ribbon to attach the bed ribbons to the axles. While the wheels are now attached, they can still move around, so it's recommended to hold the baby carriage from the bottom. There's one more exposed side of the baby carriage and one more receiving blanket. In the back of the carriage, where the back side of the pillow is showing, tuck the fourth receiving blanket between the canopy and the pillow to create a flap. Now the baby carriage looks finished from all directions. The parents-to-be now have a fantastic gift they'll treasure.